Crazy Shirts T-shirt and casual wear catalog offers quality products with superior comfort and durability for the entire family. Crazy Shirts t shirt catalog - Crazy Shirts beach wear and t shirt catalogs bring you more than just your average Joe t shirt. Take your t shirt collection to a whole new level with specialty dyed t shirts that capture the magical essence of the islands dyed with all natural ingredients, real flavors and screen-printed with cooler than cool graphics and original designs. Find beach t shirts for men, women and kids available in a rainbow of colors, tinted with an array of unique ingredients that range from organic Hemp and Hibiscus to Volcanic Ash, Money, gourmet Chocolate and Kona Coffee dyes, plus Beer brewed tees and straight from the vine Wine dyed shirts made especially for beer and wine loving aficionados. Men's wear - Hang ten with men's beachwear staples that go a step beyond everyday t shirts and board shorts. 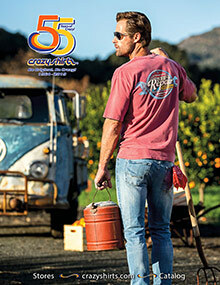 Explore a t shirt catalog collection of specialty tees from Maui Brewing, Rogue Brewing Co., Stone Brewing Co., Wyland Clothing and more. Choose from short sleeve men's tees that come in sizes up to 3XL and/or long sleeve t shirts that protect against transitional weather. Shop by color, design or mix and match to find shirt and short styles that look awesome together. Whether you're hitting the surf or the hammock, you'll find a tropical paradise of Hawaiian polos, sweatshirt hoodies and pullover beach shirts, Canton sweatpants, twill Crazyshorts, Bottle opener hats, swim shirts and board shorts that will suit you just fine both in or out of the water. Women's wear - Embrace Island style adventure with fashionable and feminine beach ensembles that will take you island hopping or from the beach to the boardwalk and poolside with ease. Browse their specialty dyed t shirt catalog to find your favorite long sleeved and short sleeved beach shirt styles as well as tank tops, chill proof hoodie sweatshirts and jackets, pretty hand dip-dyed Pima dresses, skirts, board shorts, pants and more stylin' gear reserved for fashion forward beach babes. Kids - Outfit the little ones in your life with the Crazy Kids t shirt catalog collection of miniature kid-friendly sized versions of their most popular beachwear styles featured for men and women! From boy's rocking board shorts to adorably sweet Pima dresses for little surfer girls, you'll find a stylish, comfortable and always durable selection of boy's and girl's swimwear styles, hoodies and must-have short and long-sleeve beach shirts that they'll love to rock in the sand and surf all season long. If you always believed that a t shirt was just a t shirt, you haven't experienced tees from Crazy Shirts t shirt catalogs. Invest in comfortably cool and casual island-inspired beach apparel, swimwear and distinctively dyed t shirts for the whole family, from the company who has ridden the wave of success for over 40 years.